Just time for a spot of gratuitous self-promotion. 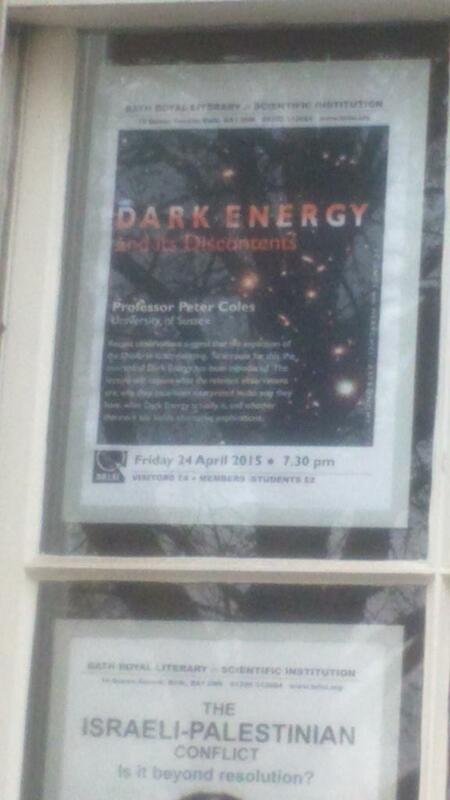 I shall be giving a public lecture tonight, Friday 24th April 2015, entitled Dark Energy and its Discontents, at the very posh-sounding Bath Royal Literary and Scientific Institution. 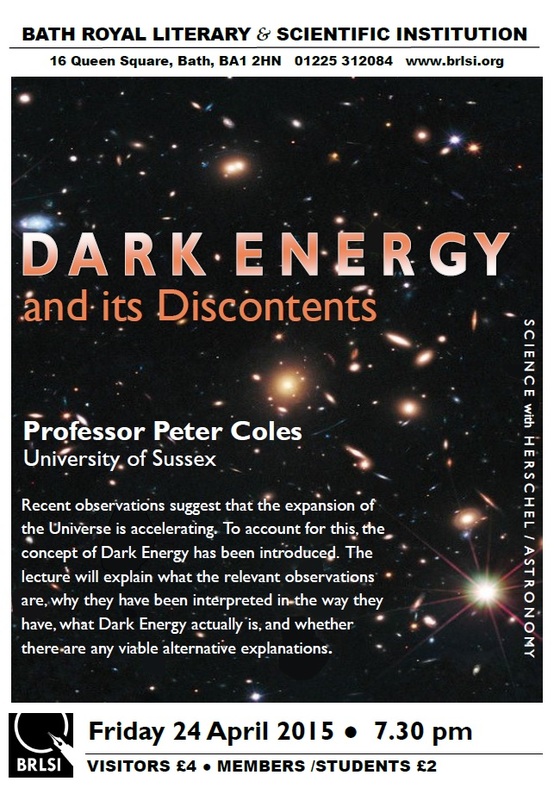 I am just finishing the slides for the talk, and packing some dark energy in my bag to use as a demonstration. Perhaps I’ll see the odd reader of this blog there? My trip to Bath yesterday turned out to be very enjoyable and entirely free of aqueous complications. The train ran on time from Cardiff to Bath Spa, although it was hideously overcrowded. 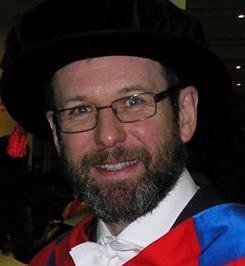 About an hour later I was met at the station by Gary Mathlin and taken to the University campus in his car. I didn’t get to see much of the city because it was already dark, but parts of it are very beautiful in a very Jane-Austen type of way. The University of Bath campus is a very different kettle of fish, a 1960s modernist construction in which I would have got completely lost had I not had a guide. Quite smart though. Better than most of its ilk. The talk itself was in quite a large and swish lecture theatre. I’m not sure how many turned up but it might have been close to a hundred or so. Very mixed too, with quite a few students and some much older types. I thought it went down quite well, but you’ll really have to ask the audience about that! I answered a few questions at the end and then there was a very generous vote of thanks and I was given a gift of a very interesting book published by Bath Royal Literary and Scientific Institution. Thereafter I was whisked off to dinner, which I hadn’t realised was going to happen. I had the chance to chat to various people, including students and members of the William Herschel Society, all of whom were very friendly and convivial after a few glasses of wine. Fortunately, Gary Mathlin lives in Cardiff so he gave me a lift home afterwards so I didn’t get back too late. This morning I had to head straight to London without going into work in order to get to Imperial College to give a lunchtime seminar at the Theoretical Physics group, which is based in the Huxley building. I think it is named after T.H. rather than Aldous, because I wasn’t offered any Mescalin. Of course seminars like this have a much smaller audience and are much more technical than public lectures, but I still found myself having flashbacks to the previous evening’s lecture. I talked about various bits and pieces arising from work I’ve been doing with various people about the cosmic anomalies I’ve blogged about from time to time. After this we went to a local pizzeria for a late lunch (and a couple of glasses of wine). I would have liked to stay longer to chat with the folks there, but I wanted to get back to Cardiff at a reasonable hour so I left in time for the 4.15 train. Walking back home from Cardiff station along the side of the River Taff I was struck by its rather sinister appearance. Still high after the recent rains, and lit only by the lights of the city, it glistened like thick black oil as it flowed very quickly down towards the Bay. I felt more than a hint of menace in the sheer volume of water streaming past in the darkness. So far we’ve escaped the worst of the season’s bad weather. The fells of Cumbria, in the far north-west of England, have had 14 inches of rain in 2 days, which is a record. If that happened in South Wales I’m not sure even Cardiff’s formidable flood defences would cope! The forecast for this weekend is terrible so I don’t think I’ll be doing anything very much outdoors. That suits me, in fact, as all this travelling about has left me well and truly knackered. Time for an early night, I think!